We will develop high-fidelity computational models of multiphase flow in channels, using high-resolution CFD (i.e. 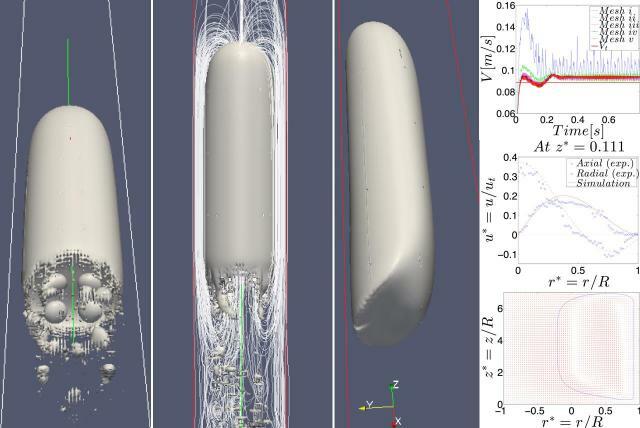 direct numerical simulations and large eddy simulations) combined with an interface tracking method (i.e. level set). The CFD-based simulations will generate a numerical database from which new (algebraic) closure relations can be extracted for existing multiphase 1D codes used by the oil/gas industry (e.g. OLGA). Focus is on the slug flow regime, which is very often encountered in oil/gas systems. A sensitivity study of current mechanistic models of slug flow will identify what closure relations and related effects will have to be simulated, e.g. dependence of Taylor bubble speed on its shape, or dependence of void fraction on shape and speed of small dispersed bubbles in the wake of a Taylor bubble, or liquid film thickness dependence on bubble speed, and so on.